Doing a photoshoot in a supermarket was never high on my list, but there I was on vacation, three thousand miles from home, with only a travel camera and a kit lens. Luckily the camera was a Fuji XT2, and lens was Fuji’s XF 18-55mm f/2.8-4, the most capable kit lens I’ve ever used. I was walking by the vegetable section in the produce department of a Fred Meyer’s Market near Portland, Oregon, when I saw this explosion of color, and even under the horror of fluorescent supermarket lights, I knew I had to capture the color and symmetry that some anonymous produce department person – someone who obviously should be working in arts – had set up to delight and entice the ravenous soccer moms of the Pacific Northwest. This should not have been an easy task but two factors worked to my favor. 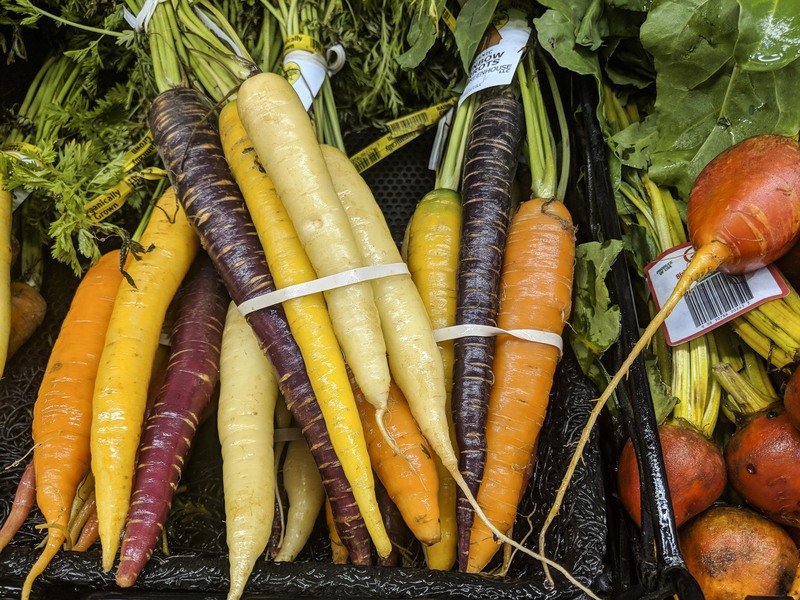 First, this supermarket periodically sprayed their produce with a fine mist of water, which kept the carrots and beets damp and vibrant. Second, the Fuji XT2 handles colors magnificently. These little crop format cameras have an uncanny ability to continuously knock me out of my shoes with how they render colors. In this case, the camera’s processor made mincemeat out of the bad fluorescent lighting and left me with very minimal post production tasks. To me, the resulting photo captured all of the shades and promise of late summer – when the photo was taken – promising the bounty of the harvest time to come. I have smaller cameras and I have bigger, more capable cameras, but to me, the Fuji XT-2 is the perfect travel camera, providing all of the features I need in order to hit any creative needs that might come up on location, thousands of miles from home.